Kids back at school? And the bugs that come with it? No sooner do the kids start a new term than they pick up some lurgy or other. Coughs and colds, upset tummies, sickness bugs and headlice are among some of the main culprits, all of which can be treated at home with basic medicine available from your local pharmacy - no GP appointment or prescription required! Alternatively practice nurses, can help with lots of minor conditions which mean you don’t need to see a GP. Remember that children can get between eight to 10 colds a year, and a cough can last at least three weeks before it starts to improve. Visiting your GP and getting medication on prescription, which could be easily bought over the counter, costs the local NHS approximately £45 each time you visit. For further information on treatment of common childhood illnesses you can view or download the local NHS ‘Your Guide to Childhood Illnesses’. 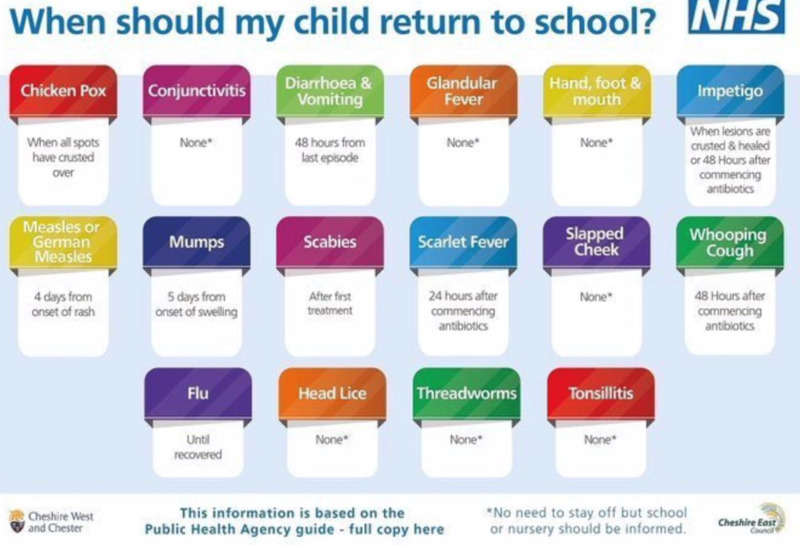 A handy guide on common childhood illnesses for parents of children under six, it also has information about spotting the signs of a serious illness and local NHS services. Heading off to university or have children starting university? Whether you’re a fresher or heading into your final year, or a parent of a university student, we have a few basic health care tips for students. 1. Get the ACWY vaccine – it protects against four different strains of the meningococcal bacteria that cause meningitis and blood poisoning (septicaemia): A, C, W and Y. Ask your GP practice for the vaccine. 2. Register with a GP when you get to university. You never know when you might need medical help. If you take any regular medicines that are only available on prescription, for example the contraceptive pill, make sure you have enough to last the term or until you can register with a doctor close the university. 3. Take a first aid kit with you. It might not be the most exciting thing to pack but a first aid kit with plasters, painkillers, treat for upset stomachs, thermometer, tweezers, insect bite cream or spray and antiseptic cream is a good start.